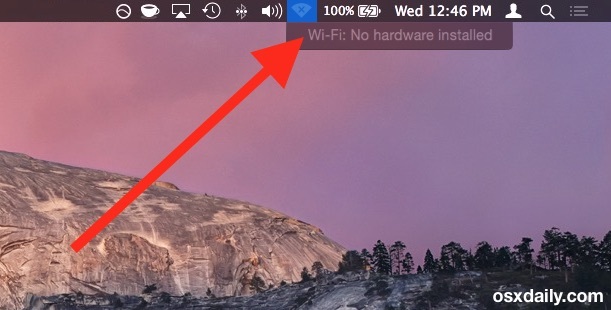 Some Mac users may encounter a stranger wi-fi issue where the wireless menu icon has an “X” in it, and the wi-fi dropdown menu says “Wi-Fi: No Hardware Installed”. Since we’re all dependent on wireless networking these days, having no functioning wi-fi connection can be very frustrating, but fortunately this is usually a really simple fix. Typically if you experience this problem, you’ll see the ‘Wi-Fi: No hardware installed’ message after waking a Mac from sleep, rebooting the Mac, or sometimes after installing a system software update. It can happen on any MacBook, MacBook Pro, Air, iMac, Mac Mini, Mac Pro, and virtually any other hardware, though MacBook users are usually the first to notice it given the propensity for wireless networking usage with Mac laptops. The trick to resolving the wi-fi hardware not installed error is usually two parts; you’ll reset the SMC and reset the NVRAM as well on whatever Mac that is displaying the problem message in the wireless menu. This two-part troubleshooting method works on every Mac and every version of Mac OS X, so it doesn’t matter which model or OS version you are experiencing trouble with. Since resetting SMC is slightly different on each Mac, first we’ll cover resetting the NVRAM which is the same on every Mac model. When the Mac boots back up, pulldown the wi-fi menu again. Is it working? Is the wi-fi menu no longer showing the “X” and “No hardware installed” error message? Is it looking for networks? Then you’re good to go. If you still have problems and still see that error message, you’ll want to continue on with resetting the SMC which we’ll cover next. When the Mac boots up you should no longer see the “X” in the wi-fi icon and wi-fi should work as usual on the Mac. If the wi-fi works, join wifi as usual and you’re good to go. 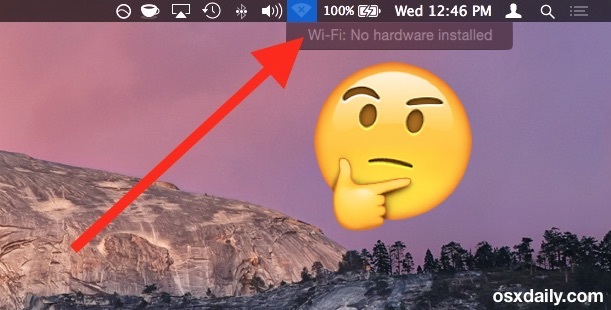 Still seeing the “Wi-Fi: no hardware installed” error on the Mac? If you reset the Mac NVRAM and SMC and you still encounter the “Wi-Fi: no hardware installed” message in the dropdown menu in Mac OS X, you may have a physical hardware problem with the computer in question. Usually this means the network card has failed, has become disconnected, doesn’t exist (as in, it was manually removed), it’s a third party external wi-fi NIC model that needs different drivers, or perhaps even the Mac had liquid contact and has suffered some form of damage. In any event, if it can’t be resolved with the methods outlined above and it’s not a software wi-fi issue, you’ll likely want to make a trip to the Apple genius bar or official call center. Did this work to get your wi-fi working again? Let us know your experience in the comments. I had a similar issue on a i5 2011 Mac mini running El Capitan. SMC and NVRAM resets did not help. I even dismantled the whole thing to see if the Airport card is connected properly. Nothing. And then, there was a OSX software update and voila. Came back to life just like that. It seems that running any available combo update could also theoretically help, so maybe it’s a good idea to try this insead of waiting for another OSX update or reinstalling the whole system. I’ve had the ‘no wifi’ problem appear after installing a software update on Mac, reset SMC fixed it. I’m getting more and more problems with Mac these days, and many with iPhone too. Im having the same problem, but how did you get your Mac to update if you couldn’t get internet access? Ethernet?? you can install HoRNDIS drivers and then use USB Tethering option on your smartphone to use phone’s internet. Had this once before. It fixed it. I’ve had this problem before on my 2010 MacBook. One time, a simple reboot fixed it. The other time the permissions on some kexts had gotten messed up and it couldn’t find the hardware until I did a permissions repair in Disk Utility. The SMC reset fixed it!!! Tried all of that. Still not working. Strangely, it works in safemode. Same here, How do you solved? Had the same problem with my 2009 mac pro, the SMC reset fix it. Hope Apple patches this soon. Great tip – fixed the wi-fi issue in 5 min. Tried the NVRAM and it fixed it..!! Gongrats & many thanks!!! Tried the SMC and NVRAM on my early 2015 Mac book air and still doesn’t work. Oh man, I think I’m dying. My MacBook Pro (Retina, 13-inch, Early 2015) has this problem. I used the shift, contorl, option and power thing and it works fine… but the problem happens on and off, sometime while im working and suddenly it stops and i have to do this processs. same exact model and problem, and the fix mentioned only helps temporarily. I have stopped relying on my MacBook to actually do work. One work around, if I really need to use it, is that I plug my iPhone into it and use the USB connection to tether the internet to the MacBook (I think that is the right terminology). You have to do it before the wifi actually disappears or it will never recognize the USB connection. Hard to believe my MacBook is almost useless. Neither worked for me. I left PC for this nonsense!? Not happy with Apple these days. how did your problem end today? lifesaving tips! Fixed it in like 60 secs! Thank you!!!! NVRAM restart worked for me first try! Thanks. Hi guys, none of these things worked for me. Anyone any help? Would be life saving! Wifi no hardware error on my MacBook pro early 2011. Tried all the resets and nothing worked. Finally repaired permissions from disk utility and rebooted and it worked. 3: A normal restart, this fixed everything. Worked with the NVRAM! You guys are the best ♥️ Thought I’d have to go and get a new Mac! Worked like a charm . Thank you for the great tip. My MacBook Pro does this all the time and I’ve tried everything off this website to fix it and it normally works but it’s not this time and it’s been like that for 4 days I need my laptop with internet badly but nothing is working! How do I fix it?? worked like a miracle on the iMac, thank you! Great tip, forgot all about that from my powerbook days. It started up when I upgraded my RAM to 8Gb on my 21.5″ iMac 2009. How can u do a software update without internet connection? Do I need an Ethernet cable? It says I can’t connect to App Store. Shift control option power worked like a charm! Thank you! None of these fixes worked for me, but deleting my NetworkInterfaces.plist file did. These fixes worked then they didn’t. Permanent fix for me was to get an $8 Edimax USB WiFi adapter. 2.4 GHz only, but better than nothing. Others are available for more. Interesting thing is that built-in WiFi continues to come back sporadically. It will work for a few days, then stop. I reset the NVram previously, and that’s when this no hardware issue came up. I reset the Nvram as suggested, that didn’t work, but after resetting the SMC fixed the issue. The no hardware issue happened ironically when I reset the nvram before reading this post. resetting the SMC did however fix the issue. None of the methods worked for me either. I have a late 2013 MacBook Pro Retina 13″. The last thing I remember doing was running CleanMyMac 3? None of these resets worked for me. I even tried all the steps from the comments and still nothing. Called Apple and tried the resets with a rep and nothing. Took it to the Apple Store to find out it’ll cost me $147 to fix, the cost mainly being the labor! I’ve only had my MacBook for a year and a half. The fact that my machine, which wasn’t cheap, for NO good reason has stopped working kills me. I have tried every suggestion above and also from all commenters. I have a macbook mid 2010 edition. This computer even went back to the Genius desk for a repair on the display (main board replacement for a flat fee during 2014, i can’t remembr the price) ; after 1 year, the display’s issues became worse (streaks of lines appearing at the bottom of the screen, and edges of the screen collapsing inside, all very weird; it appears like a kaleidoscope). Have 2 iphones 4 and 5S with lots of issues too. Had 2 ipod nanos, also useless now due to batteries being dead. Meanwhile at the office i have been using a HP Probook Core i3 for 5+years at 8-10 hours per day….and NEVER had any issue with it! You know what!? I have had it with Apple and their overpriced garbage! These fixes worked for me the first few times, but the problem was recurrent (every time I closed the screen on my Mac) and they stopped working. The thing that did work for me and some may find helpful (found on another help board): for users who use a lot of different wifi networks in different places, the list of saved networks becomes very long and the wifi is likely to crash going through them all each time. So I went to System Preferences –> Network –> Advanced and deleted most of the networks I joined once while travelling and will likely never use again. This seemed to work for me. I had this problem with a mid 2012 MacBook pro. Apparently the cable connecting the wifi card to the logic board can become loose, so I opened up the back and pressed all of the connections. So far it has fixed the problem. Ifixit have good tutorials on replacement of the wifi cable. Follow the same steps but instead of replacing just push the cable back into the connection. Thank you soooooooooo much. Thought hardware issue and was without wifi for a year… fixed immediately…..
My mid-2010 Macbook Pro has lost wifi capability. Changed Airport Card, SRC, NVRAM, etc. Nothing. Wifi won’t even come up when trying to add location. Genius bar said because my Mac is from 2010 that it is “too vintage” to work on and won’t even look at it. Extremely frustrating. I can connect via ethernet, but it won’t allow me to do any diagnostics. Every 10th or so NVRAM reset, it will work for 5-30 mins before kicking off again for no reason. Says it’s still connected to Wifi, although obviously not. Then it won’t allow me to turn Wifi back on. Stuck in off mode. Reset and shows either “No hardware installed” or just blank without ability to turn on. Thoughts? The SMC reset worked for me. Thank you!!! You’re my favorite and a lifesaver!!! This is for anyone for whom the SMC reset didn’t work: I tried these resets over and over again without any success, when suddenly I realised that the issue was my Bluetooth connection. I went into my networks folder via system preferences and saw that my network was connected to “Bluetooth PAN”, not wifi. Once I deleted this from the list entirely and created a new wifi folder (using the plus sign) it all worked perfectly again. This may be a very rare issue unique to my situation but I thought I’d flag it just in case it’s helpful to any of you. Good luck! NVRAM reset worked for me! thanks! Tried using SMC reset, didn’t work out as well. I was still getting ‘No Hardware Installed’ error. Then tried NVRAM reset and the error message was gone and Wi-Fi started working as before. Thanks for this quick fix. I normally don’t comment on this stuff but thanks this was a life saver it worked ! Thank God u saved my life! My life! Thanks man it really worked for me really appreciate it 😊. I was having the same issues on my early 2011 Macbook Pro 15″ for a long time. As mentioned on several forums I thought it was the wi-fi card that broke and I got a new wi-fi card from the internet, also went for one that had Bluetooth 4.0. After installing the card and enabling continuity it worked for a short period of time, until it all started showing the same thing – “no hardware installed”. Setting csrutil disable and back to enable solved my problem. But i think it’s not the ultimate solution. It might be a battery problem. First step didn’t work, but second step did..Thank you! This is unbelievable. No one knows how to reinstall a driver on Mac? A bad Linksys driver destroyed my MacBook Pro networking. No one knows how to re-install the factory driver? Seriously. I’d have this fixed on Windows in two minutes. There is no “reinstalling drivers” process in Mac OS, that’s not how the Mac works. There are no drivers, this isn’t Windows. Instead, the Mac supports its included hardware (only Apple makes Macs remember) directly in the operating system. For third party hardware components, third party software is used. If installing some junky third party software component ‘destroyed’ your networking, then restore from a backup, or reinstall MacOS system software. You can do that without formatting, just reinstall the OS. I have a 2011 Mac book pro, these both didn’t work but I tried repairing permissions in disk utility with a reboot and it worked ! It worked like a charmed, you little beauty. Mine is a 15” mid 2010 MacBook Pro. Still going strong. Dude this is amazing, I love it so much, I tried reinstalling my pc, then also the Time machine back-up, nothing worked and I lost my music also, then I came across this thing. NVRAM fixed it real quick and also my laptop is not lagging at all, it is just amazing. Love you. This just happened on my MacBook Air and I was freaking out. The SMC after trying a few different times. Thank you!!!!!!!!!!!! Hi! My problem is that the SMC reboot works, but I still have to do it all the time. Seems like I reboot and then after a while it will disconnect from the WiFi again and say no hardware installed, with the ‘X’ and everything. btw I have a MacBook Pro late-2011, Any ideas? I’ve been trying to fix this issues since forever, went to service center I didn’t get proper answer, apple products is becoming thrash these days with lots of problem and issues. I’m getting rid of Apple now. Steve Jobs gone so does apple. Feeling frustrated ! In case anybody is still facing this issue. I FOUND THE FIX! The issue is with the firmware most probably. I was having the same issue and tried doing everything mentioned in the article to no avail, took it to apple store and they said it’ll cost about 300 EUR, I told them to shove it inside their buttocks! Now, coming to the solution. Try installing this driver, it is from a third party vendor but works! It totally fixed my system. If you are working with more than one OSX version, install it for everyone individually. Apple genius, my a**! They are so incompetent at their work, its ridiculous. Saved myself 300 EUR! tried that link.. it’s broken ? can commonly happen after loading a new OS. Thanks; I really appreciate the advice. The NVRAM reset worked for me! Praise Jesus! Thank you! Glad this helped resolve your wi-fi problems on the Mac, you’re welcome! I had been dealing with the wifi working, then going off with the error (no wifi hardware installed); I could sometimes turn the computer off and start it up again and the wifi would be back for an hour or so… then, out again. I tried pretty much everything I read on this and similar pages short of changing out the wifi device. Then I came across the fix. So the wifi device has a few plugs, and ribbon wires are plugged into the the wifi device. The plugs hang down from the wifi device – but they are securely connected, or at least they should be. But every time you set your computer down, you create a micro shock or vibration that works against the plug. My computer is a 2011 model, so this has been happening for several years. Well, over time, the plug becomes loose – so that it has a tenuous connection to the wifi device. And this is what makes the wifi sometimes “exist” and other times be “not installed on this device.” In fact, the computer is reporting an accurate error – as there is little difference between unplugged hardware and non-existent software. The fix is super simple: just unscrew the bottom of the MacBook and unplug and re-plug the wires into the wifi device. Presto – your wifi will work like new. No problems, no need for new hardware, and no need to reboot SMC or other things. Im on 2010 model macbook, and the Shift + Control + Option + Power Button worked to fix the problem. I’M USING A MACBOOK PRO 2012. SIMPLY SHUTDOWN THE LAPTOP. START IT UP AND IMMEDIATELY PRESS COMMAND R, IT WILL TAKE YOU TO RECOVERY MODE. YOU SHOULD BE ABLE TO CONNECT TO WIFI FROM THERE, IF NOT, USE THE DISK UTILITY REPAIR/ FIRST AID OPTION. RESTART YOUR MAC ABD YOU SHOULD BE GOOD TO GO. THANK YOU. Thank you for the help. The SMC trick for newer models fixed my problem! This page saved my life. Thank you for the information. I had this problem and tried the solutions, but nothing worked. I’m not sure if I tried them right. I was resigning to having to get it checked but once the laptop run out of battery, it restarted and it was fixed! I tried every solution stated above and still can’t get it to work. I have no issues if I hardwire into my router but no WiFi or Bluetooth. Any further suggestions?